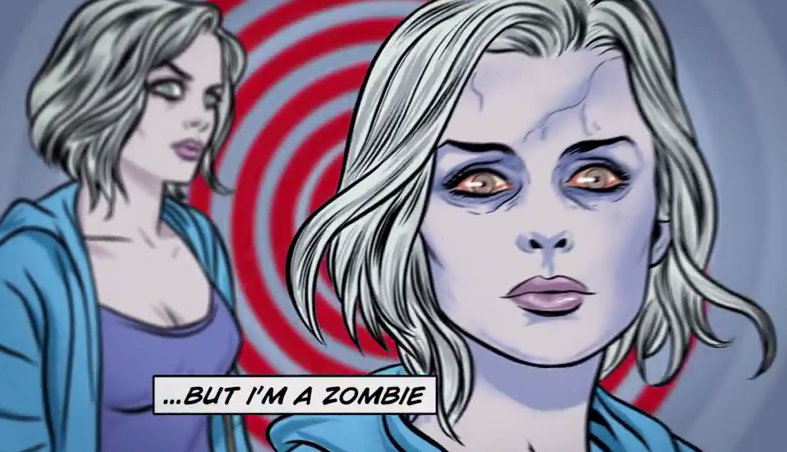 There is no better way to honor the source material for CW's upcoming dark comedy iZombie than to have the artist who illustrated the comic book series to design the opening titles. Michael Allred (Silver Surfer, Madman) lends his signature style that made the comics a hit to the loosely based live-action adaptation. Created with writer Chris Roberson for Vertigo Comics, iZombie tells the story of a medical student who becomes a zombie joins a coroner's office in order to gain access to the brains she must reluctantly eat so that she can maintain her humanity. But every brain she eats, she also inherits their memories. Now she uses her abilities to solve their deaths with help from the medical examiner and a police detective. The series stars Rose McIver (Liv), Malcolm Goodwin (Clive Babineaux), Rahul Kohli (Dr. Ravi Chakrabarti), Robert Buckley (Major Lilywhite) and David Anders (Blaine DeBeers). Veronica Mars creator Rob Thomas is the executive producer along with Diane Ruggiero. iZombie debuts on March 17 at 9 p.m. on The CW following the return of The Flash.